This week we chat with Amy Hershey, owner of Loudoun Pilates in Leesburg, Virginia. 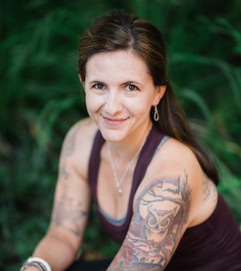 Amy graduated from The Pilates Center, Boulder’s 950-hour Advanced Teacher Training Program in 2009. She lives on a horse farm in Middleburg, VA with her husband, son, 3 dogs, 6 horses, 4 cats and 1 mini-donkey. Aw! As well as being passionate about Pilates, she is passionate about helping animals and families whose pets are undergoing cancer treatment. In her “free” time, she loves horse-riding, hiking and sleeping. Hi Amy, how are you today? Where are you right now and what are you up to? Hi Amanda! I am taking my evening ‘quiet time’ at home in front of my Christmas tree after getting my 3-year old son to bed and all the animals on my farm fed and tucked in for the night. I trained at TPC in 2009 while I lived in Boulder so I was lucky to get to do all my hours at The Pilates Center, Boulder studio! Are you a Host Advisor or LTT? If so, please tell us a little about how you enjoy these roles? I am a host advisor. I enjoy being an advocate for TPC because I truly believe their training is the best and the most in-depth I have seen. I also enjoy working with trainees because it reminds me of my days as a trainee and keeps me humble while also allowing me to reflect on how far I have come as an instructor. I attended college at The University of Colorado, Boulder and went to The Pilates Center, Boulder to take Pilates lessons. I had no ambition to become a Pilates teacher. My first teacher at TPC was Kelli Hutchins and she basically told me early on that I would be a great teacher and should do the program. I hesitated for nearly 3 years but eventually caved – anyone who knows Kelli knows she is very difficult to say no to! I already had such a strong connection with TPC as a student so I did not give any other school serious consideration. I think the depth of understanding that you gain about each movement and exercise is beyond anything I have seen from other programs. I believe gaining that solid foundation of the Pilates method is what gives you the confidence as a new teacher, and as you continue your advanced learning as a teacher. I love when I find out that other teachers I know and respect are actually TPC grads! It is always such an unexpected surprise to realize how many TPC grads there are out there and how many really well respected Pilates pros are grads!! My experience at TPC has granted me a career that I was not expecting. I was unsure what direction my life was headed and had no real career ambitions so stumbling upon The Pilates Center, Boulder literally shaped my professional life. Now as a studio owner and continuing education provider, it is surreal to think about how much signing up for a private lesson at TPC back in college impacted my life. I guess going to college really does lay the groundwork for your professional life…just sometimes in ways you don’t anticipate! Do it! There is no comparison and you will never regret the experience, knowledge and support you will get there. The chair! It is versatile and hard and stretchy and so unexpected. I vividly remember when Kelli told me it was time to enroll in the Advanced Reformer class for the first time and I was SOOOO nervous and I remember other trainees were observing the class and kept encouraging me along. It was such an accomplishment for me personally when I got through everything and a testament to the support environment of TPC.